Can Kyrie do it again? The Golden State Warriors didn’t lose very often this year, but when they did, the Dubs tended to bounce back with a vengeance. 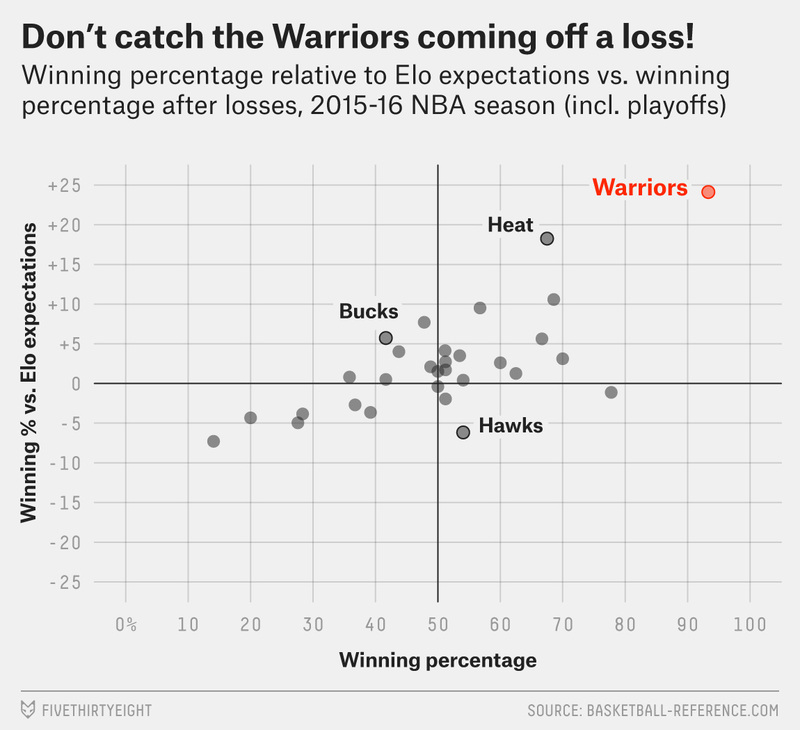 Following the 15 losses for which we know the next game’s outcome1 (including the playoffs), Golden State went 14-1, which was not only the NBA’s best record coming off a defeat, but also 24 points of winning percentage better than a statistical power-rating such as our Elo method would predict. (That was also tops in the NBA.) As terrifying as the Warriors are in general, they’re ever so much scarier still after a loss. That’s the version of Golden State the Cavaliers will tangle with Thursday night in Game 6 of the NBA Finals. As usual, LeBron James will have his work cut out for him. The good news for Cleveland: The game will be played at Quicken Loans Arena. Putting aside everything else, that means the Cavs should probably be favored to force Game 7. The bad news: Golden State’s not-so-secret weapon, Draymond Green, is coming back from his suspension. And less obvious on Cleveland’s bad-news front — but perhaps equally important — is how much the Cavs relied on an uncharacteristically amazing Kyrie Irving performance in Game 5. According to Game Score (John Hollinger’s rough estimate of a player’s performance in a given outing), Irving’s 33.2 mark easily represented his best game of the 2015-16 season, and was more than double his usual per-game output. Irving is, by nature, on the streaky side as far as NBA players go — the standard deviation of his Game Scores was 19th largest among 126 qualified players this season.2 (Stephen Curry, believe it or not, is the most “streaky” player, in terms of standard deviation in his Game Score — though his variance runs from “extremely great” to “closer to league average.” On the other end, Jonas Valanciunas and DeAndre Jordan ranked as the most “consistent” players among those performing at league-average or better.) So although Irving is capable of putting up huge numbers, as in Game 5, it also takes something fluky, like a hot night of unsustainable shooting, to pull it off. Speaking of which, Irving’s Game 5 featured the second-best “shot-making” performance of the entire playoffs,3 with Kyrie hitting for an effective field goal percentage (eFG%) 34.1 points higher than we’d expect based on the location and defensive pressure applied to his shots. During the regular season, Irving outshot expectations by only 1.9 points of eFG%, and shot-making tends to regress heavily to the mean from game to game. To stave off elimination, the Cavs might need Irving to buck those odds. That 33.2 Game Score represented the best performance by a LeBron teammate all season; Irving also owns five more of the top 10, and 12 more of the top 25. LeBron chronically seems in need of strong supporting performances from his teammates, and if Irving doesn’t supply that again, it’s not clear who will — particularly with Kevin Love limited (to say the least) after suffering a concussion earlier in the finals. In other words, a not-insignificant portion of the Cavs’ Game 6 hopes are resting on a repeat performance from a streaky player. When it comes to Cleveland sports, crazier things have happened. Perhaps this time, the Cavs will come out ahead in the exchange. Our sports podcast Hot Takedown talks about the Cavs’ comeback chances. So, not counting the Warriors’ loss in Game 5 of the NBA Finals. We’re defining those as players who played at least 50 games and averaged a Game Score of at least 8.0 per game. Minimum 20 field goal attempts.